Welcome to Electric Rc Helicopter Forums, Guest. RC Flight Simulators - Crash While You Learn! Flying model aircrafts rates as one of the most intriguing hobbies. Very few things can compare to the experience of seeing your first RC airplane or helicopter take flight. For non-pilots, seeing someone else fly an RC aircraft is extremely captivating. So captivating that often times it makes you want to learn to fly! Then the story starts. You spend hundreds or thousands of dollars to buy your first airplane/helicopter plus a few more hundred for the radio, fuel, batteries, gyros, glow plug, flight box, charger, fuel pumps, engines, starters and a hundred different things that the shop tells you is a must. Just when you thought that the cash spill finally ends, it doesn't! New RC pilots quickly learn their first lesson - that it's hard to fly! So what to do? Easy, get an instructor! Well, this also means more money and a few hours of lesson time. No matter! In for a penny in for a dime! You take those lessons and learn everything you can from the (expensive) instructor. Pretty soon, you can fly "half" the time! Great! Then eventually the lesson time runs out and you're on your own. That should be ok, since you are now "half" a pilot - or so you thought. On your next flight, you take the RC airplane / helicopter out and attempt your first solo flight. Suddenly for some reason that you don't understand, you loose control and crash. Unrelenting, you fix the craft, spent (much) more than a few dollars and hit the flying field again. You finally realize why you crashed last time, and you overcome it. Wonderful! But this time there's another hurdle, you turn the aircraft in to face you, you get disoriented and then - yup - another crash. You fix it; try again, crash again, and again and again - and yet again. A few months, a dozen crashes and thousands of dollars later you finally learn how to fly! Wow! Great ending! This story repeats itself over and over with every new pilot. No matter how careful, a new pilot will crash more than a few times as they learn. In doing so, they will have to pay hundreds or thousands of dollars. Sadly, this fact "was" absolutely true - before! Nowadays new pilot can learn to fly without having to pay for expensive instructors. Even better, they can crash their aircraft as often as they want without having to spend any money to fix it! How? The answer comes on a CD Rom, the Flight Simulators! To be fair, RC flight simulators are nothing new. In fact, they were around since the 80s. However, early flight simulators were extremely unrealistic and so expensive that it might be cheaper to actually crash your model a hundred times. Luckily, competition and technology changed all that. Modern flight simulators' realism rivals that of the latest computer game - in other words, extraordinary. Some versions come with an exact replica of a real radio controller as a joy stick, others will come with a connector cable that allows learning pilots to plug in their favorite RC controller, really good versions will allow for both options. The physics engine that come incorporated in these flight simulating are also the very best modern programming technology will allow. Simply put, everything that can and will happen on the real airfield can and will happen in the simulated flight at 99.99% accuracy. And that is not an overstatement. Price of these RC simulators is dropping too. Really good and well branded simulators costs around $300 dollars. Others that are just as good are available for just under a hundred bucks. The best deals come even cheaper than that, they are free! Don't think that free RC simulators aren't up to scratch; they offer features that rival their high priced counterparts. Still, even the most expensive package will pay for itself on the very first simulated crash you make (and you will make lots of them). So there you have it, the best way to learn to fly an RC model today is to crash, crash, crash, and crash some more until you got it! Of course, do the crashing on a flight simulator where it won't cost any money. 1. I wanted to start with something affordable so I though that the Esky Honey bee king II might be a go start, Where I live it is half price or more to T-rex etc..Is this a sensible choice fellers? 2. The guy in the store told me to buy E sky´s SIM PACK(13£) being an ex pilot my self I knew that the transition would be rough, going from fixed wing to rotary and RC it is the devil-Now just how big a difference is there between that Sim and other, can I learn well with this equipment? 3. Being used to training with a sylabus and flightpatterns I find it difficult to train without markers and boxes( areas) where can I download patterns or similar for hovering and flying box and circular patterns compatible for FMS Sim? Hello Wiko and welome to our forum! First of all, now is a great time to start flying electric rc helicopters with the price coming down. Now to answer your questions. 2. The esky's sim pack is a good beginner's sim. I have that pack my self. The good thing about it is that it comes with a USB controller that will allow you to use the sim even if you don't have a transmitter. If you want to go for a really realistic top of the line sims though, go for realflight G3.5 or PhoenixRC. I am a user of realflight G3.5 my self and I can say it's physics engine and overall performance is pretty good. I've heard lots of good things about Phoenix too. And it being launched way after realflight means that it should perform even better (and it's cheaper too). 3. 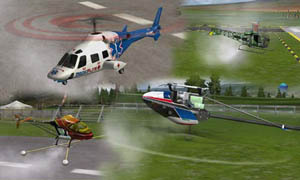 To learn patterns for helis in the sims, you can use the training program that comes with it. For realflight G3.5, I found the orientation training especially useful. In this exercise, you have to pilot your helicopter to catch your instructor's "ghost" helicopter. And it gets harder and harder. In aerofly, there's a "break the ballons" type training program. Ohh my gosh the phoenix sims looks stunning! 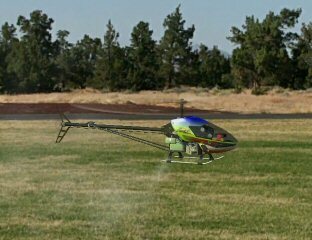 Heres a couple more to feast your eyes on..
Just purchased my first helicopter, an E-Flite Blade 400. I intentionally wanted a very steep learning curve and took interest to the hobby after playing with a coaxial blade the other week. Just playing around with the brand new helicopter, I managed to go through a set of main blades even before taking off the ground. Was a friendly reminder it wasn't a toy and I had to put in the effort if I wanted to enjoy it. After some research, I purchased Phoenix RC simulator and have been putting a few evenings a week into it. After wondering whether I could be convinced wrong for not starting with something easier, I can now hover comfortably. The lesson learnt here is that there's no fundamental barrier buying a intermediate helicopter as a beginner if you're willing to spend the time on a simulator and absorbing the experience of others. I'm only starting but have saved plenty of dollars and frustration. Lastly, patience is important while learning, the new helicopter sat on the bench for weeks before I took it to flight. I'm sure I'll go through parts but am quite glad I purchased the simulator especially as I progress in proficiency. Very True philip_blade400 something I will be doing that is for sure. I just have the Blade CX2 & MCX, have flown bigger helis which friends let me fly. Before I put down the cash for a bigger heli I will buy a sim, maybe I can talk the girlfriend into buying me one for Christmas. The ones I have seen above look excellent. I would much rather practice on a sim than crashing a $400.00 dollar plus heli and then spend money and time replacing parts only to crash again, hell on a sim crash and learn. Thanks again guys. Have a good one and fly like no tommorow. Comment form closed due to spams. Please use the forum to post comments instead. 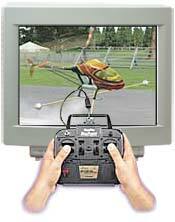 RC flight simulators - learn to fly at home!